Figure on a path by a river in a wooded landscape. A fine picture which would benefit from a clean. Ernest Parton was born in Hudson, New York in 1845 and was the younger brother of the notable painter, Arthur Parton (1842-1914). Arthur, who was taught by the American painting master, William Trost Richards, encouraged young Ernest to follow in his footsteps and invited him to train with him for two years in his Broadway studio in New York City. He first exhibited at the National Academy of Design in 1866 and continued to exhibit his paintings there until 1897 and was elected a member of the Artists’ Fund Society of New York in 1873. That spring, he sailed for England, as his brother had four years earlier. Finding success in London, he decided to remain, renting a studio on Newman Street and exhibiting two paintings at the Royal Academy in 1875. In 1876, the artist visited the Swiss Lakes and Northern Italy, making many sketches. 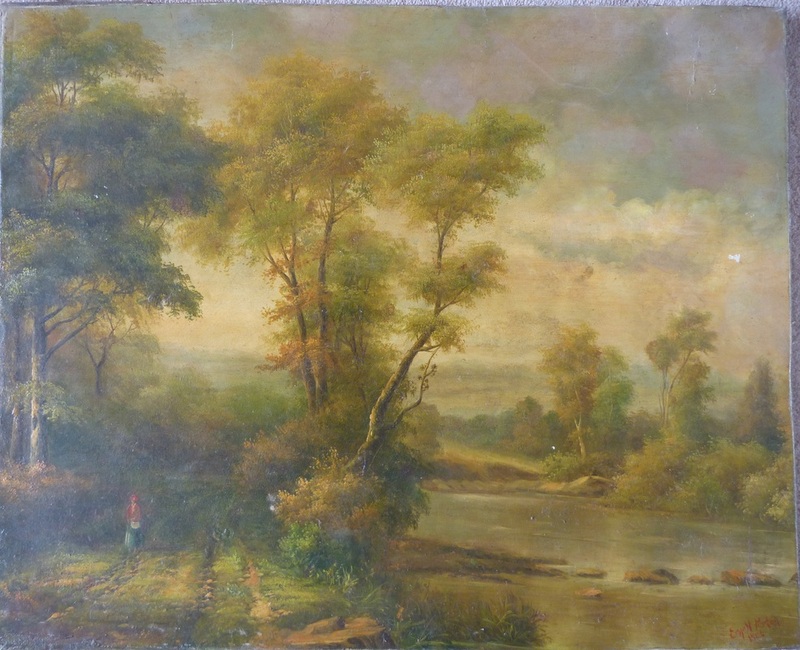 Parton painted in both the Tonalist mood of Corot (1796-1875) and in the Barbizon style, the latter of which he more fully embraced and is more closely associated. While in London, he met and became close friends with fellow American artists Theodore Robinson, John Singer Sargent, Daniel Ridgeway Knight, and Henry Bacon. Ernest continued through 1931 to exhibit the Barbizon-style paintings that had brought him success. He exhibited annually at the Royal Academy through 1932 and at other venues in England, Scotland, Ireland, New York, and Springfield, Massachusetts. The artist also exhibited at the Paris Expo (1889 and 1900), Paris Salon (1892 and 1894), and the Pennsylvania Academy of Fine Art Annual Exhibition in 1905. His work was of consistently high quality and the artist found an eager and steady market throughout his lifetime. He continued to paint until his death in New York in September of 1933. 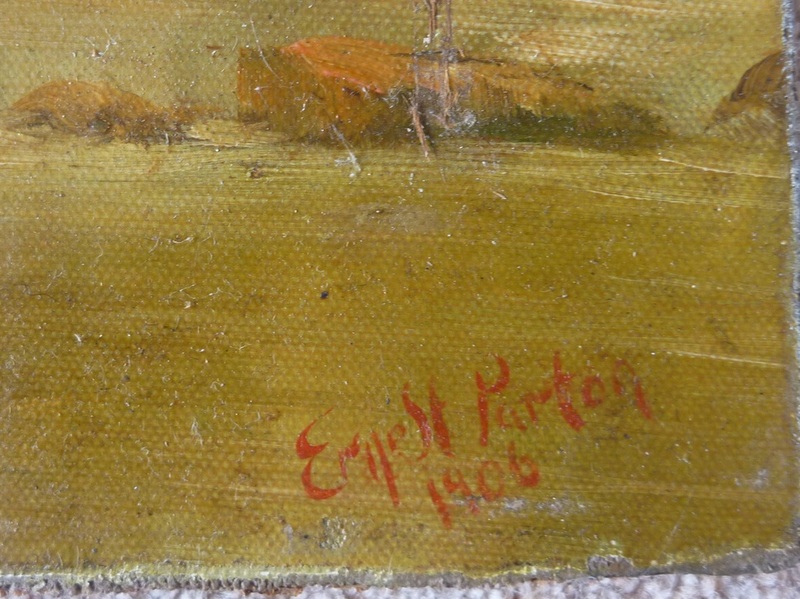 Ernest Parton’s works are in a number of prestigious public and private collections, including the Tate Gallery, London, England; Walker Art Gallery, Minneapolis, MN; Reading Museum, Reading PA; the University of Southern California, Los Angeles, CA.South Kensington Museum, London, England; Salford Museum, Salford, Greater Manchester, England; and the Sunderland Museum, Sunderland, England; among many others.